Every year since the iPhone was launched in 2007, we’ve seen growth in mobile device usage across Australia. And this mobile revolution is as important to small business owners as it is to everyone else. Research by Capterra shows that for retailers, mobile point-of-sale technology is growing at a rate of almost 10 percent every year, while the sales of traditional POS devices (think: cash registers) are declining at 2.5 percent per year. For businesses owners who are constantly on the go, a mobile POS is critical for efficiency and scalability. Running your business from the device in your pocket — tracking sales, accepting payments, sending receipts and accessing business reports — can mean the difference between success and failure. 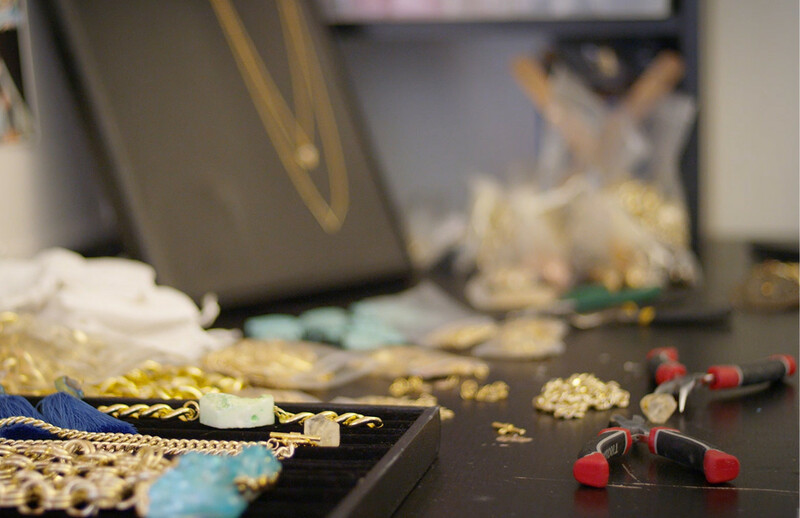 Erin Browne is growing her jewellery business — Melbourne’s Tinka the Label — using a mobile POS. She designs and hand-crafts jewellery that she sells at markets (including South Melbourne Market and the Rose Street Market), pop-ups and in a temporary space at Eastland Shopping Centre. We caught up with Erin to hear how she manages multiple staff, multiple locations and a growing business while keeping mobile. Tell us a bit of the story behind your business, and how you share that with your customers. Tinka is a locally designed, handmade jewellery brand, and my main focus is quality and originality. I take into consideration the comments and compliments I hear from my customers, so that I can continue to offer them not only a great product but also a memorable experience. I sell to women ages 14 to 84, of all different nationalities, from beach bums to the punk rockers. They all want the same thing — to have something different than the norm. What did you learn in the first year? I worked part-time during my first year, so that I could be self-funded and learn as I go. My mother was a small business owner, and I had a vast amount of experience in retail and customer service, so I basically worked with what I knew and learned all the rest. When I took the leap of faith and made Tinka the Label my full-time commitment, there were a lot more hours involved — I missed dinners and celebrations — as well as many trials and errors. But I wouldn’t have it any other way, as it has all led to where I am right now. How do you make your business stand out in a busy marketplace? I see businesses get too involved in what their competitors are doing and try to copy or outdo one another, and the market then becomes oversaturated with the same old thing. For me, the most important thing is to concentrate on what I do best. I think that being in my own little world sometimes reflects this, as I don’t design according to what other people consider to be the next big trend. Is it challenging to remain committed to handmade jewellery while trying to scale and grow your business? This is one of my biggest obstacles. My goal has always been to have everything made in Australia, whilst expanding to create the empire I’ve always dreamed of! However, it is almost impossible to accomplish this. Right now I still hand-make all of my designs. But moving forward a small percentage of my jewellery will be be made overseas so that I will be able to meet demand whilst maintaining my brand’s authenticity. What has been the biggest surprise over the last 12 months? How I could work so much and not be exhausted! I honestly felt more overworked while working 9 to 5. I’m constantly told to slow down and not over-exert myself, but knowing how far I’ve come and where I’m going is what gets me up in the morning. You’re now running multiple markets and pop-ups in the same weekend, all at the same time. How do you manage it? I’ve been using Square for over a year now, and the many functions that have been introduced (over the last year) have really helped me run my business across numerous locations. Creating locations and employee logins has been the most crucial for me, as I’m able to track which sales were processed by which staff at which location, enabling me to determine who my key saleswomen are, as well as where Tinka the Label is being best received by customers. Having insight into my best-selling items and peak shopping times also really does assist in the success of my business — and having all this data readily available, I am easily able to distinguish what it is my customers want. How fast are you growing, and where do you see your business in a year? I’ve been expanding from two market days a week to eight, and I’m also in the middle of rebranding Tinka the Label. I’m preparing to move forward with a stronger online presence, as well as stocking in select boutiques overseas and across Australia’s renowned shopping destinations. If you’d like to go behind-the-scenes with Erin to see a day in the busy life of a small business owner, Tinka the Label is taking over Square’s Instagram for one day, kicking off at 7AM (AEST) on Thursday 6th July. Follow @SquareAU on Instagram, and don’t forget to follow Erin on @TinkaTheLabel, too.